All Hallow’s Eve into Halloween into All Saints’ Day into Dia de los Meurtos to today, Election Eve. No more tricks from Rec and Park administration and their Private Partner, the City Fields Foundation. The reason we’ve been locked out of Our Parks and the reason there may not be enough places to Let SF Kids Play is because they put up the fences, locked the gates, and created the shortage. Their Toxic Turf fields around town hold water and pollute and waste every drop that falls from the sky. 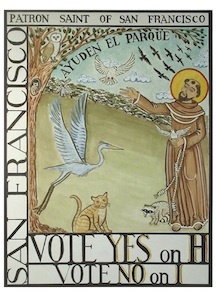 The City’s Patron Saint, San Francisco, Patron Saint of the Environment, Animals, and Ecology, would surely abhor these fake, toxic City Fields. Many San Franciscans do too. So we vote to determine the fate of Our Parks. In the meantime, I’m voting to set the fields at the Beach Chalet free so that we can play there freely, for Free. The fence was constructed without a permit within the Coastal Zone. That chain link is as ugly as the collusion between the City and its Private Partners. An Enforcement Action by the California Coastal Commission is warranted and necessary. The letter to CCC Enforcement follows. The San Francisco Recreation and Parks Department maintains property located in Golden Gate Park in the Coastal Zone. The property in question is known as the Beach Chalet Fields. A CCC permitted project (an artificial turf fields complex with nighttime sports lighting) at the Beach Chalet fields will be voted upon November 4, 2014 as the result of a Citizens Ballot Measure Initiative action. San Franciscans will decide whether the project will be undertaken. If the Citizens’ Proposition is successful and receives a greater number of votes than a competing proposed ordinance put on the ballot by members of the San Francisco Board of Supervisors, the CCC permitted project will not be allowed by the San Francisco Municipal Code. This is a likely scenario. In the event of that occurrence, an 8′ chain link fence surrounding the fields may remain in place. Per the staff report written for the CCC on the permitted project to be voted upon, this fence was constructed without permit in the Coastal Zone and, in the opinion of CCC staff, does not conform to the LCP. The existing fence serves no purpose other than to restrict access to the naturalistic area intended as a pastoral context for sports play. Limiting access is a strategy that the current management of SF Recreation and Park employs to execute a pay­-to-­play, privatization strategy in San Francisco’s beloved parks. Seven generations of San Franciscans and visitors to the Coastal Zone enjoyed free access to the area in Golden Gate Park in the Coastal Zone which belongs to all Californians. It has only been in the latter generation that access has been limited by a fence erected without public process or permit in the area mentioned. In addition, Recreation and Park Department policy with respect to integrated pest management and the fence has degraded the natural environment. Recreation and Park staff have been instructed to use Glyphosate (in the formulation Aquamaster) rather than to manually or mechanically remove or trim weeds at the fence line. In the event that the Citizens of San Francisco vote to maintain the Beach Chalet Fields area as natural grass, rather than to construct the permitted artificial turf complex, the fence around the fields should be removed and the area restored to conform to the LCP. As the alleged violation has already been recorded, it is our hope that your office can investigate this matter and give thoughtful consideration to recommending a Restoration Order as provided for under Section 30811 of the California Public Resources Code to bring about the removal of the unpermitted development that the fence represents. Thank you kindly for your time and consideration of this matter.